An embittered detective (Kirk Douglas) finds his values shaken when he learns his beloved wife (Eleanor Parker) has a connection with a noted abortionist (George Macready) he’s been trying to prosecute for a year. 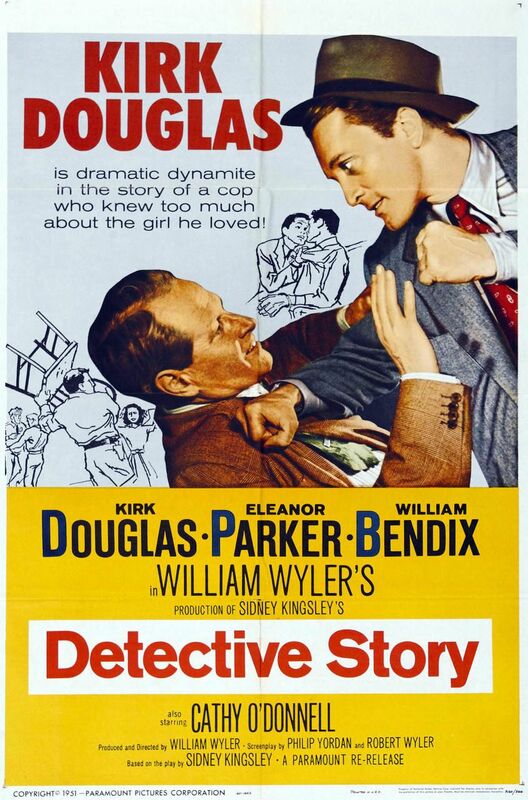 Meanwhile, Douglas and his colleagues — including his supervisor (Horace McMahon) and a fellow detective (William Bendix) — manage a variety of other cases, including a shoplifter (Lee Grant) who seems curiously content to hang out and people-watch; a young man (Craig Hill) who has stolen from his boss to impress a model whose sweet sister (Cathy O’Donnell) has nursed a lifelong crush on him; and a psychopathic convict (Joseph Wiseman) whose every action and reaction is unpredictable. 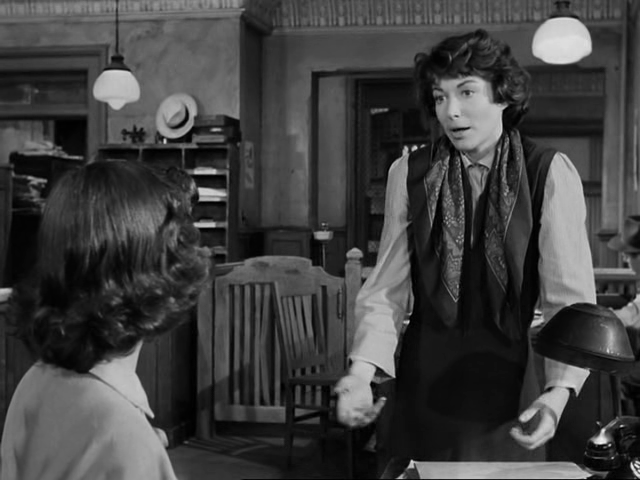 William Wyler directed this adaptation of a play by Sidney Kingsley which takes place within a single day at the 21st precinct in New York. Critical responses seem mixed about the authenticity of both Douglas’s character and the narrative pivot, with DVD Savant arguing that “the enjoyable Kirk Douglas gives one of his first over-modulated ‘star’ performances, throwing the film off balance”, and Bosley Crowther pointing out we need “not search too hopefully for plausibility in this case” given how far-fetched the connection is between Parker and Macready. I’m not disturbed by either of these factors, and find both Douglas’s performance and the central scenario quite believable. 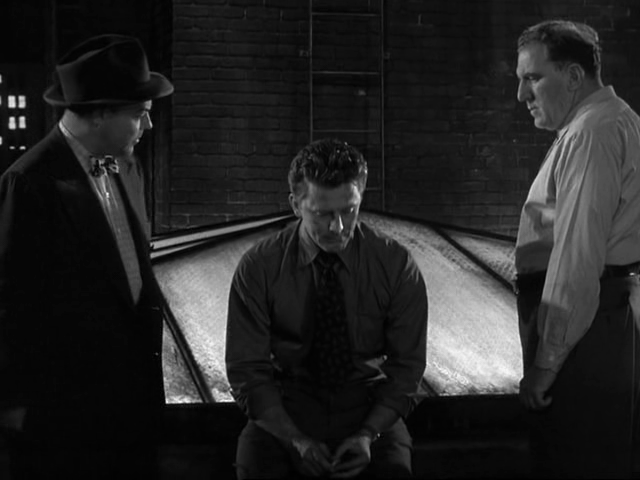 While this is very much a filmed play — with revelatory action “unnaturally” concentrated into one time stretch — Wyler nicely highlights the claustrophobia of the high-tension setting, and Douglas’s crisis seems almost inevitable given the stress he puts himself under each day (compounded by his personal history); it’s unusual to watch such a train wreck happening to a major movie star in a film of this era. 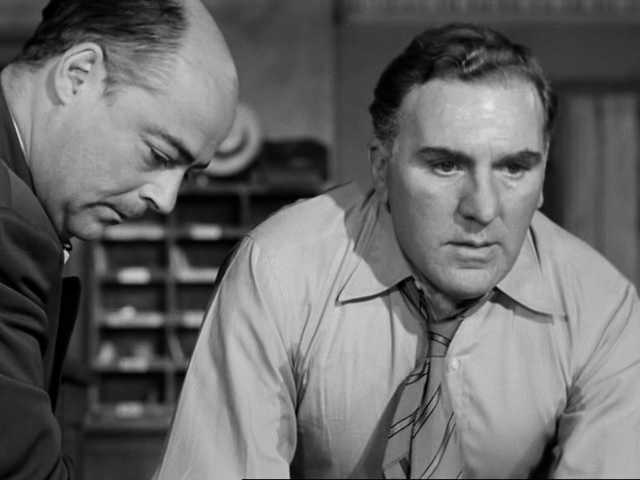 The supporting performances are all noteworthy, with Parker and Bendix especially sympathetic, and Wiseman effectively playing, as DVD Savant puts it, “a mass of ethnic gestures distorted through a lowlife’s self-awareness”. Yes, as a strong outing by a master director. A tentative once-must… mostly for the last 20 minutes – but, of course, one would have to watch the whole film to get to that point. The most effective way to approach this film (in my opinion) is to try to forget that it all plays out in a realistic setting and try to look at it as the world of an idea (that idea being the ultimate point of the protagonist). My feeling is, if you look at the film on its surface as realistic drama (esp. nowadays), it’s not as satisfying a film: it’s a bit clunky, manipulative and convenient in terms of structure, and more than a bit odd that the main character would – in pinball fashion – be jumping around from case to case to case (whether it’s his business or not). While generally successful, the ensemble acting occasionally suffers from going off-tone; here and there, the acting suddenly feels like ‘acting’ instead of ‘being’. It’s a hard thing to avoid, though, because of particular emotions that the script sometimes calls for. The film really picks up as it is reaching its conclusion – not so much because of something cumulative but because the dilemma inside the main character is a compelling one; it’s brought to light and is dealt with in an intriguing manner.